I try not to miss out on opportunities to dress my three kids alike while they are still willing. It does get a bit harder, though, as they get older and their ages more diverse. This year I chose red t-shirts for all three (Children’s Place offered free shipping on all orders for months last summer/fall. Wish they’d kept that up!) and created ornament shapes out of a gender-neutral striped print. I machine embroidered their names on the front and then attached the ornaments to the shirts with fusible web and zig-zagged around them with the sewing machine. I bought Daphne an adorable tutu made by an Etsy crafter, but sadly she refused to ever wear it again after the picture. So I guess I have a used Christmas tutu for sale! The shirts, at least, got worn many times over the holiday season by all three kids and I used these cute pictures for my holiday cards. Well, I think 3 months might be a new record for me away from this blog. Seems like my blog comes in “seasons” now, kind of like Downton Abbey. Then it’s just re-runs for a while. (This is a joke, just in case you think I have delusions of grandeur.) But I’ve been recording projects here for six years now, and in spite of this and other absences I haven’t actually stopped. In my time away the holidays happened, with their busy, crazy, happy rush and mess. My computer went all Blue Screen of Death and every second of my laptop time for weeks went to trying to get all that back in order. But mostly the daily chores of keeping three kids alive and reasonably educated has prevented me from taking the time to keep my little record of the other, more tangible, stuff I accomplish in the corner moments. Yet here I am again, rounding up some photos I’ve snapped here and there in the last weeks, writing down my projects notes so I can hold own to my own accomplishments and so my comments can join everyone else’s in the best thing that ever happened to the handicraft universe: the internet! I’m going to reintroduce myself since I’ve been gone so long. This is my family on Christmas Eve. My babies are Daphne (2), Worth (5), Dorothy (9). 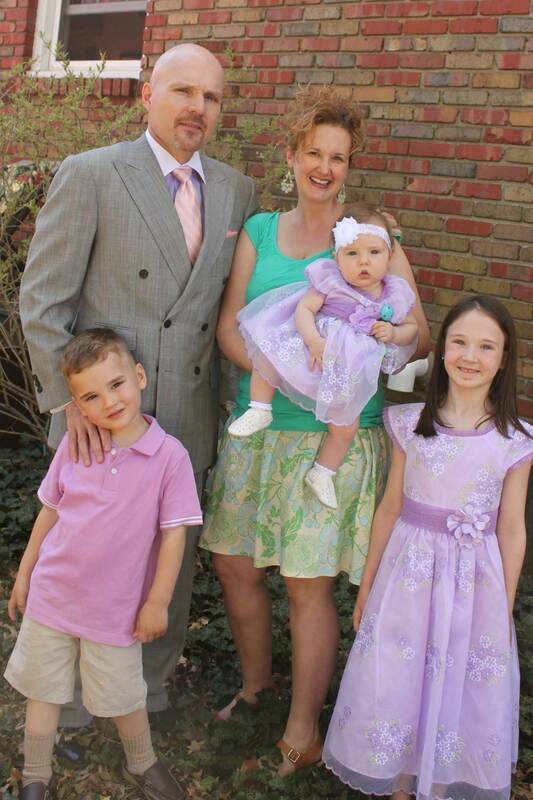 We’re a homeschooling family in Louisville, Kentucky. I bought the elf hats at the Dollar Tree and put the kids’ names on them with my embroidery machine. They cheerfully wore the hats everywhere during the Christmas season, which is possibly the only thing they all did cheerfully and in tandem except open gifts. Daphne is at a “difficult” age, which means that she occasionally lays on the floor and screams for upwards of 45 minutes because her mean parents insist on things like Closing the Refrigerator. Worth, sandwiched between my two intense girls, has a sweet spirit and his generous smile and goofy sense of humor makes the time-consuming task of teaching kindergarten very worth it (pun sort of intended). Dorothy is my very tweeny tween. She loves dolls and likes boys (already?! ), still plays with Calico Critters, wears ripped jeans on purpose, loves big earrings, but still wears her pioneer girl dress-up dress out in public. I’m Renata, keeper of this little online crafty scrapbook that reminds me I occasionally produce something besides dinner. Check back in here on upcoming Mondays and Thursdays, for at least the next few weeks! I hope my mother doesn’t mind appearing in this blog post! I didn’t actually intend to inflict a posed photo on her, but happened to catch her trying on her new set in this bottom photo and thought it was nice, so I’m including it unless she asks me to take it down. I was going to knit my mother some fingerless mitts for her birthday, but she didn’t know it and bought herself a pair on Etsy. Apparently all instances of me knitting or intending to knit fingerless mitts are just destined to somehow go wrong. Anyway, I crocheted a hat and scarf for her instead. I’d bought the nice hand-dyed wool at a fiber festival a few years ago and never found quite the right project for it, but the colors look great with my mom’s green coat and greener eyes. She’s the best, and she deserves a lot more than a hat. There are very few other single factors in a woman’s life that can make as much of an impact to her quality of life–at basically any age–as having a great mom. If my girls think half as highly of me some day I’ll be lucky. On a lighter note, we’re having one of those Christmas years where the tree needs to be up on a table where small toddling monsters can’t pull it down. Worth and Dorothy don’t remember having small trees before; they only remember being able to chose large trees the last two years. 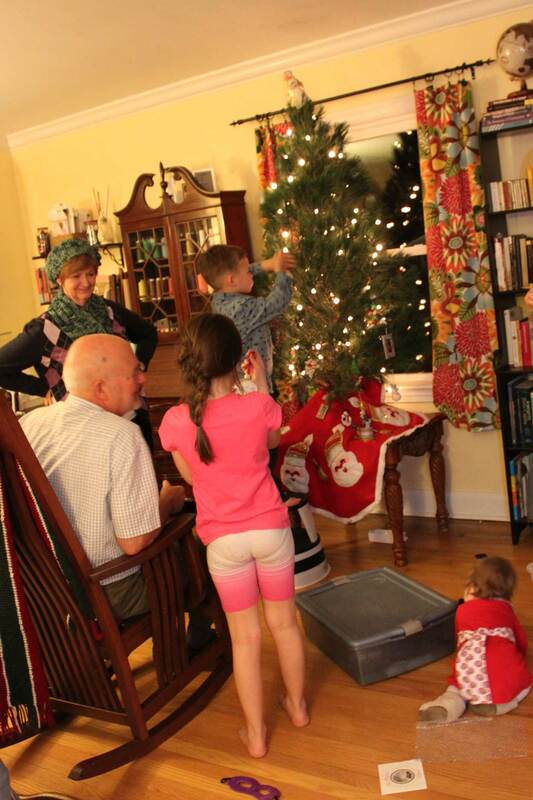 I’d like to say they were concerned about the safety of their baby sister and understood the charm of the small tree year, but in reality Rob finally offered them $2 each if they’d just shut up and act happy about getting a little tree. That worked. Merry Christmas indeed! I love Halloween! 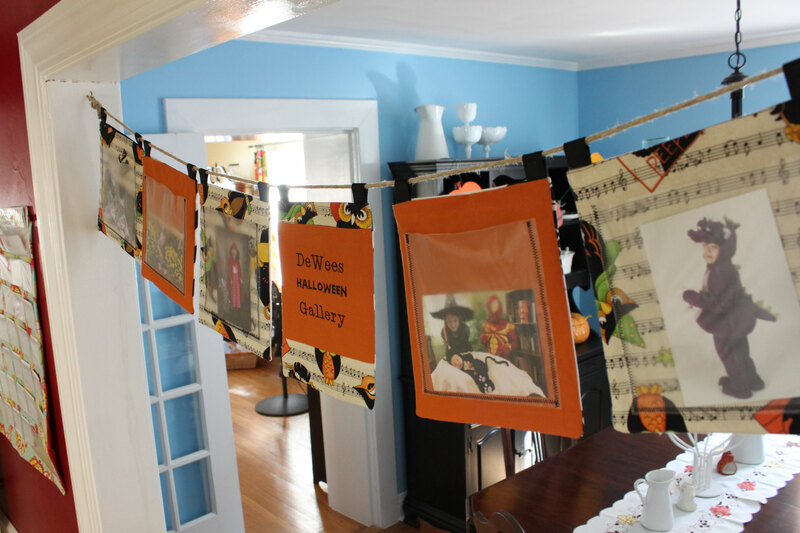 Last year I made this photo garland for our favorite costume photos; this year I decided to upgrade our dining table. 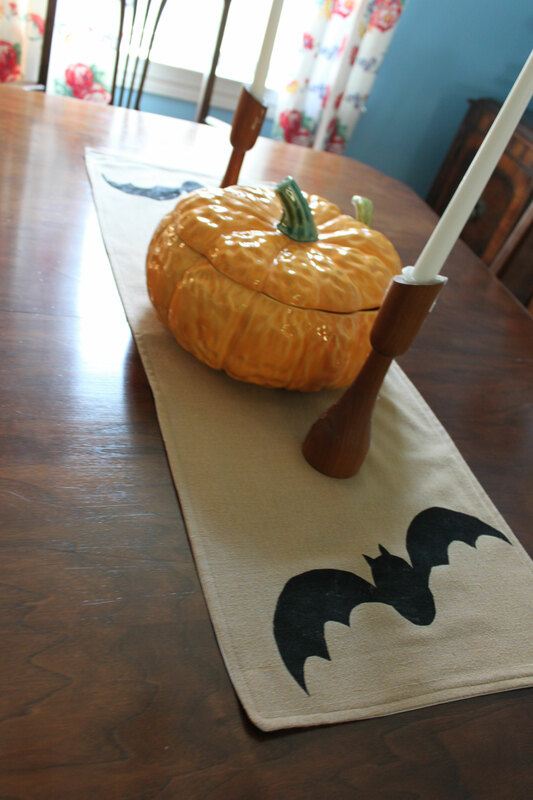 I sewed a simple table topper out of a burlap-colored fabric, then made a freezer paper stencil of a bat to paint on. 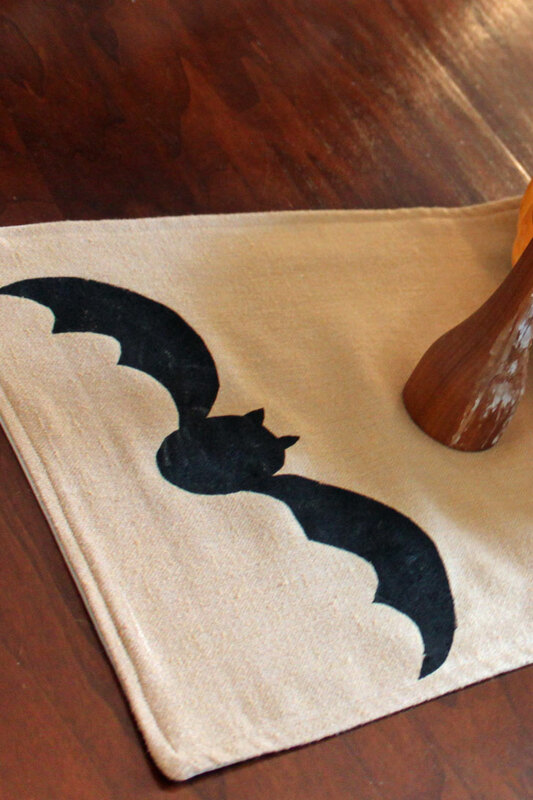 I’m not very good at drawing, so I admit to tossing three bat attempts before settling on this one, but the good thing about freezer paper stencils is that you can use them several times, so after I peeled it off my dry bat on one end, I just ironed it down and used the same one at the other end. This was a fun project and my favorite part about it is how much the kids like it. I’ve often thought that one of the best things about having a daughter is her genuine appreciation of my crafty efforts. I can show my husband one of my projects when he comes home from work, and he’s very polite, “oh that’s great! Looks so nice,” or whatever, just like he’d have said if I’d bought it from Costco. He’s a nice guy and he’d never omit a loving comment about something that’s important to me, but he doesn’t get it. But when I show my daughter something I’ve made, she bubbles over with genuine enthusiasm: “Mom! You made that! It’s amazing! 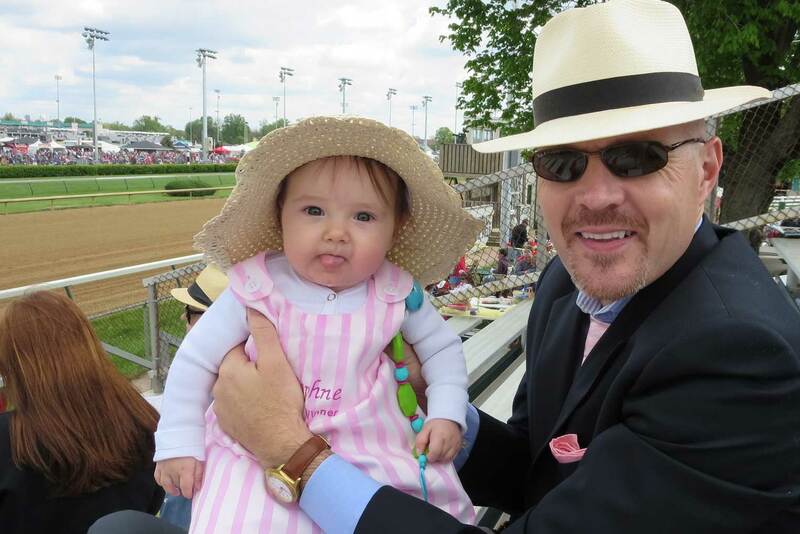 Show me how you did the….” And I thank my stars, once again, that I was blessed with a girl-child. (Two, even.) But both of my kids were truly pleased with this one and Worth is now drawing bats on every scrap of paper in the house. Fun times. 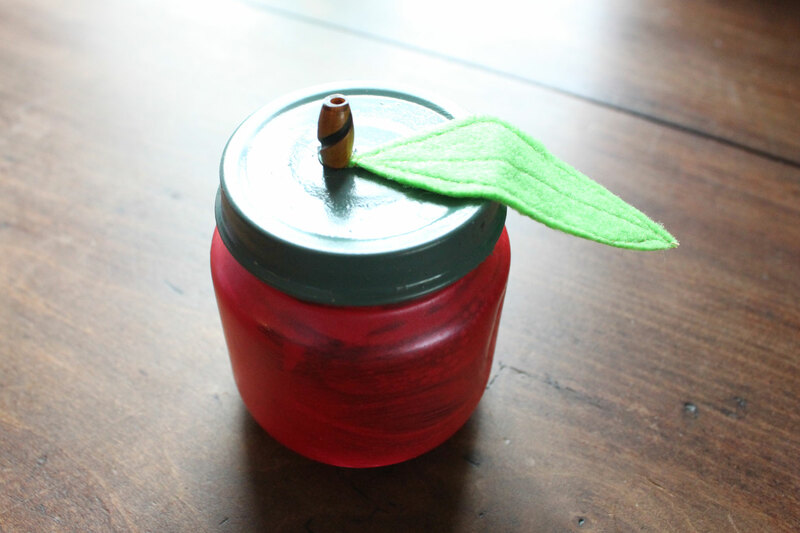 These little jars got left out of my post about Daphne’s first birthday a few weeks ago. 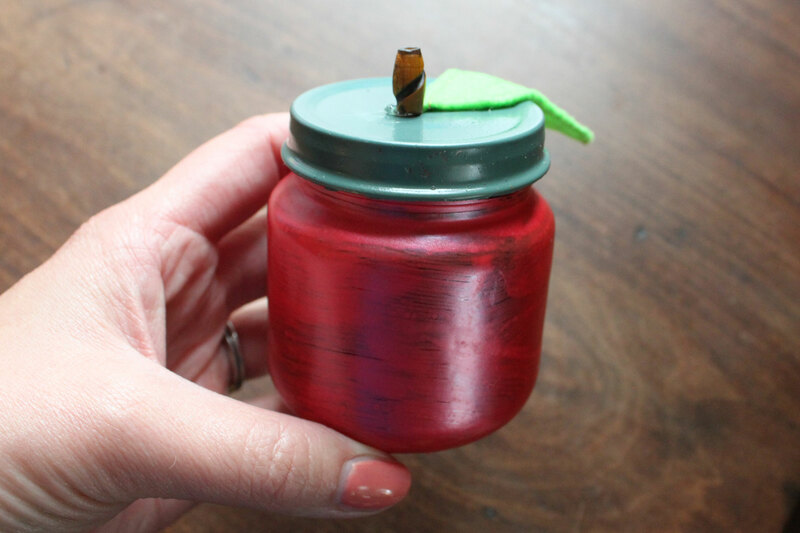 They are baby food jars painted with glass paint, spray-painted lids, then a little bead and felt leaf glued into place on the top. I filled them with M&Ms and gave them out as party favors to our small guests. They were inspired by a Pinterest pin and turned out cute, but the glass paint didn’t look like I wanted it to. I’d watched this Youtube video about liquid fill glass paint, but my paint wasn’t runny enough to do this technique. My bottle says “opaque,” so maybe that’s why? I just brushed it on instead and the jars were still nice gifts. With this winter’s crazy displacement of the polar vortex nastiness, it was starting to feel like there would never come a time when I would not have to leave the house with 4 hats, 3 scarves, and 8 mittens or gloves each time I needed to run a simple errand. And if it seemed difficult to get three children dressed for errands in sub-freezing temperatures, that was nothing compared to trying to return to the house with the same number of things. Kids shed winter-wear (including coats) in inconvenient places almost constantly, and it seemed that by the end of a shopping trip (or field trip, or dentist visit, or whatever) I started to resemble a coat tree more than a mother. My answer to this was to sew myself the World’s Largest Canvas Tote Bag. It’s the same dimensions as my laundry bags from a previous post, which were modeled after the TJ Maxx reusable shopping bags. It’s big enough to hold everyone’s discarded outerwear, plus one large plastic fire truck. Don’t ask me how I know. It has served its purpose well. 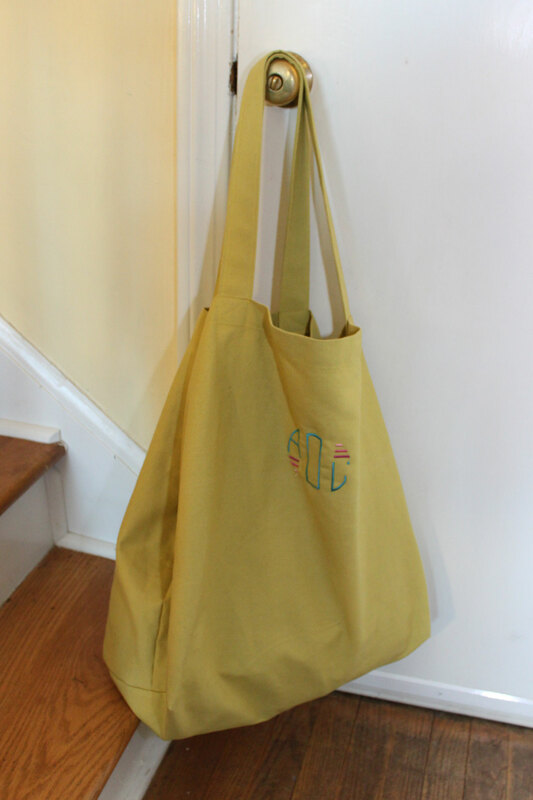 I embroidered my initials on it to make it feel more like an accessory and less like Mom’s a Sucker, but the free font I used turned out to be worth about what I paid for it–I don’t love it. The monogram doesn’t diminish the utility, however, and I’m happy to have solved my missing mitten problem. Here’s Daphne modeling some of her warm winter handmades. 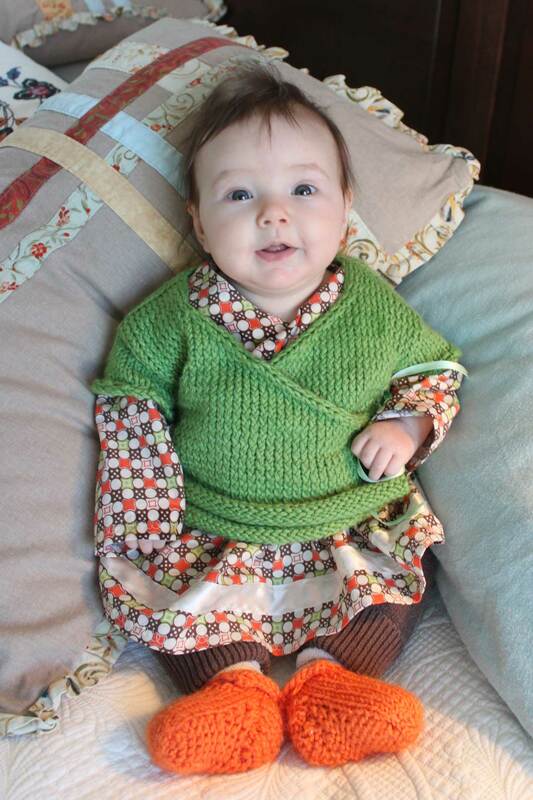 The dress is a larger version of this green one from a previous post. It’s such a nice pattern. 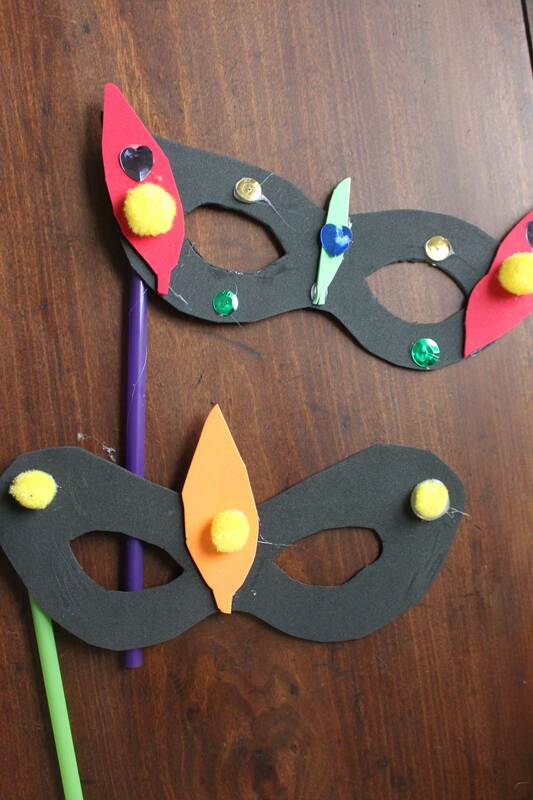 We celebrated Fat Tuesday homeschool-style, with homemade pralines, jambalaya in the crock pot, and these craft foam masquerade masks. Now that Dorothy is old enough to be confident with the glue gun it has really opened the realm of crafty possibilities. She’s done a lot with craft foam lately, which has the ease of working with paper but the feeling of permanence you get from working with fabric. We cut out the masks based on an internet template, and Dorothy glued the baubles according to her and her brother’s preferences, then finished them off with soda straws. 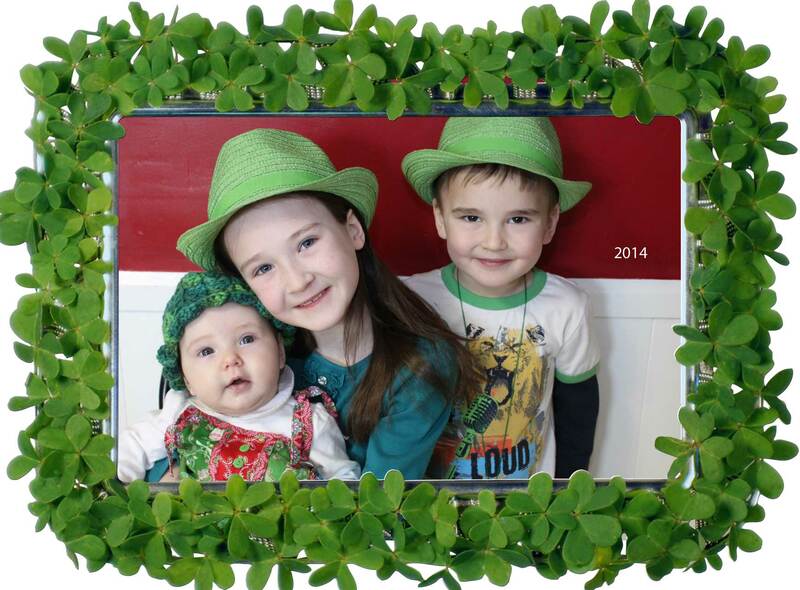 My older kids wore green hats from Target on St. Patrick’s Day, but Daphne got a homemade crocheted hat. 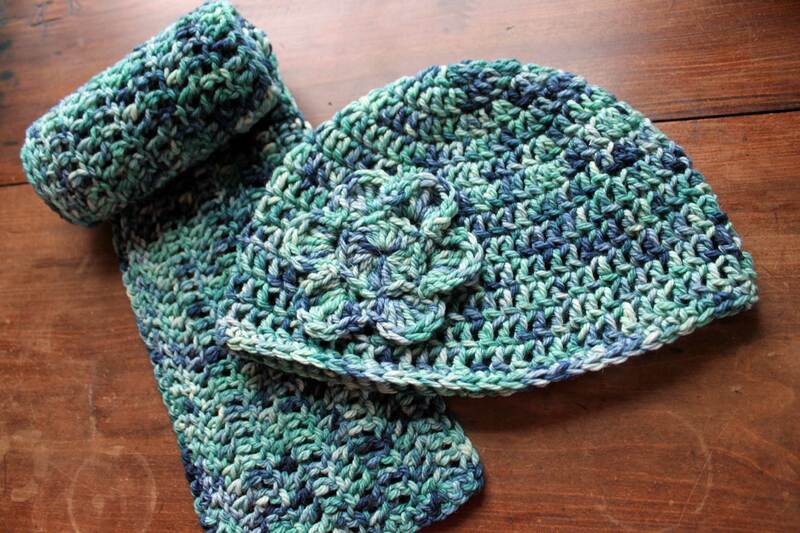 I used a baby cloche pattern from Ravelry. 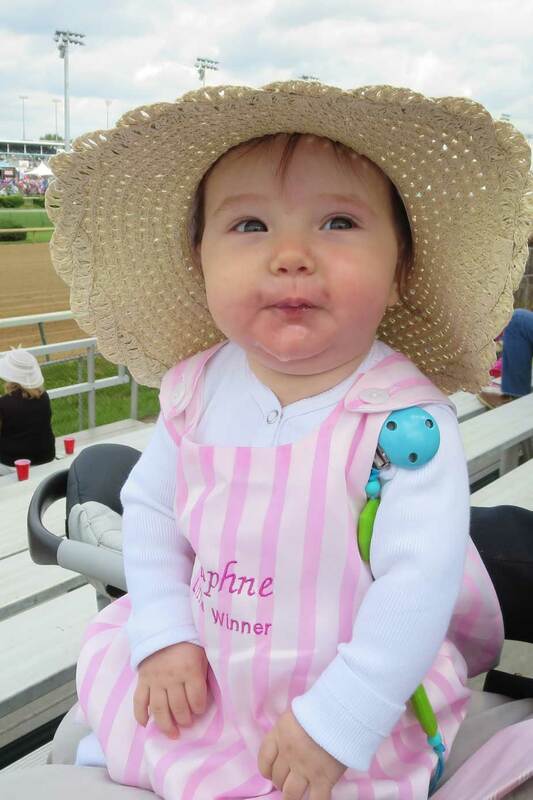 She was the cutest little leprechaun in Kentucky, I’m sure. Oops! I put this post together a couple weeks ago, right after Valentine’s Day, but somehow never posted it. As part of my new year organizing efforts last month Dorothy and I made a stash of birthday cards to have ready as we need them this year. My efforts were a little more conservative in their color combinations; hers are photographed here. 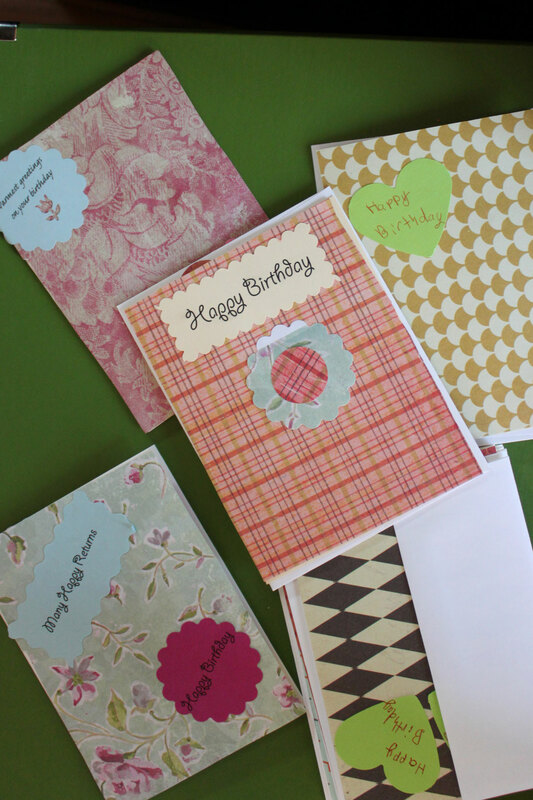 We got out craft punches, decorative scissors, glue sticks, plain card stock and a pack of decorative scrapbook paper and then had a good time. I printed out a couple colored pages full of assorted well-wishes and we combined those with our own handwritten messages. Usually our local homeschool community holds a Valentine party where the children exchange cards like they would in school. This year the event didn’t come together, but we held our own little Valentine “party” for the alphabet. Worth has been very keen on practicing his letters lately, so I’ve been trying to encourage his interest with a few little games like this one. 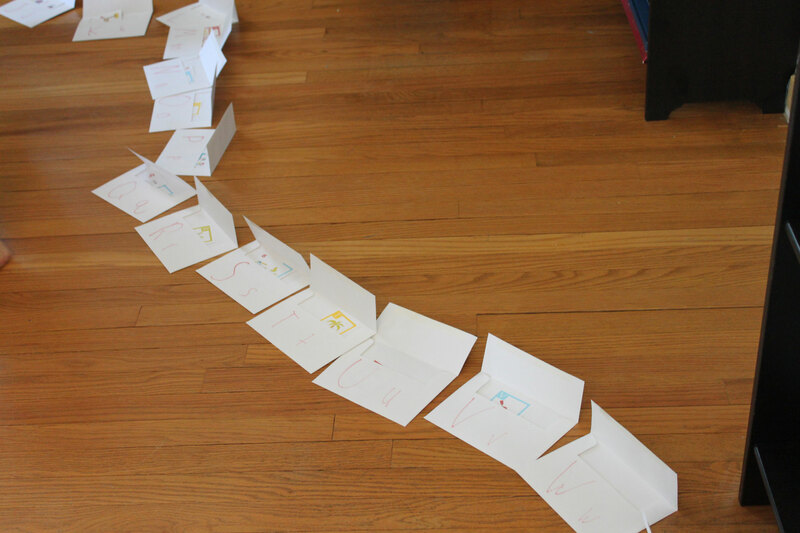 First the kids made an envelope for each letter, then we “seated” them by snaking the envelopes (in alpha order) across the room. 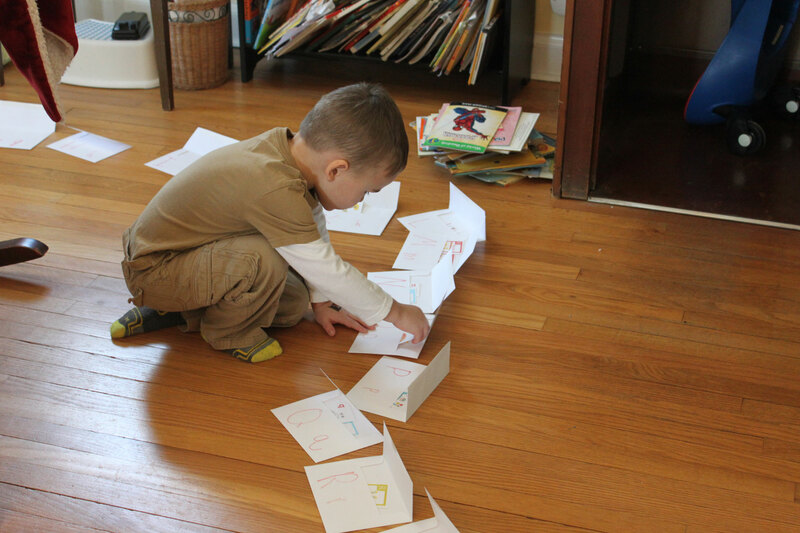 Then I gave them a mixed up set of cards I’d printed off, which were really picture/letter cards, 2 or 3 per letter, and let them deliver the cards to the correct letters. To make it more of a game I told them I secretly loved one letter best, and they had to figure out which one I’d given the most Valentine’s cards to. Worth delivered with enthusiasm, accidentally practicing his letters as he went, and Dorothy had a nice exercise in alphabetical order. They discovered that my most beloved letter was “M” for “mom.” Heh.